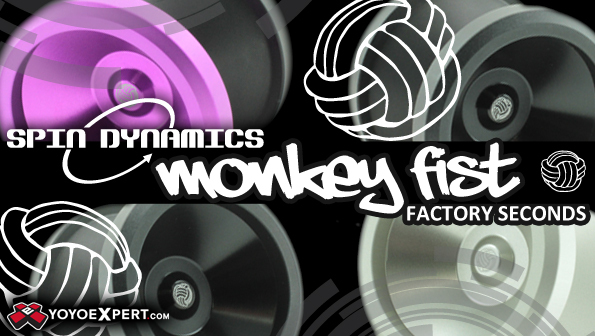 The Monkey Fist is the second amazing yo-yo from Spin Dynamics. This new company is owned and operated by professional judge Nick Gumlaw who has an amazing understanding of yo-yo design and aesthetics. The Monkey Fist is designed with a strong powerful focused rim weight and extremely smooth stable play. The shape of the body is angular with nice cutting edge rims and a design that is comfortable yet powerful. The finish on the Monkey Fist is astounding. The outer body is actually soda blasted before being anodized while leaving the inner hub area polished. A strong anodize coating over this leaves the yo-yo with a outer smooth grinding surface and a shiny inner. A class Monkey Fist is engraved in the middle on each side of the yo-yo for a wonderfully one of a kind looking yo-yo! Features the P-Pad response system that provide tight binds and last a very long time but are adhesive free and easy to remove and replace! The Monkey Fist also uses a stainless steel helicoil insert to stabilize the axle system and provide wear resistance even with extreme heavy use and the repeated threading/unthreading of the halves.